Following in Bucky's footsteps, Vermont eco-designer John Todd aims to heal the planet. John Todd was just a boy, growing up on the north shore of Burlington Bay, Ontario, when his world seemed to collapse around him. Within a few years, his childhood playgrounds of nearby marshes and forestland were transmogrified into subdivisions and a golf course. “I was a sunny kid, and then I became depressed,” recalls Todd, now 69, who says he was left “psychically rudderless” by the rapid destruction of his once-familiar landscape. That is, until Todd’s father gave him a book by Louis Bromfield. The Pulitzer Prize-winning author and conservationist wrote several books on his hometown of Mansfield, Ohio, which had been decimated by years of bad agricultural practices. By adopting sustainable, grass-based farming methods, Bromfield rejuvenated an entire valley. His ideas had a similar restorative effect on Todd. Healing humanity’s scars on the natural world — or better yet, figuring out ways to leave none — has become a hallmark of Todd’s work. 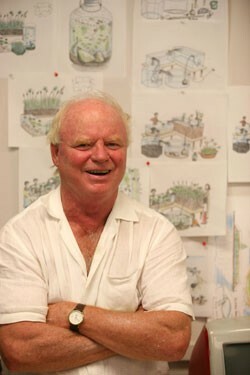 Today, he is an internationally recognized pioneer and visionary in the field of ecological design and engineering. This relatively young field seeks ways to meet humanity’s basic needs — food, water, shelter, energy, climate control, waste management and so on — with environmentally benign solutions. And it starts from the “radical” premise that humans can partner with nature rather than plunder it. No one thinks that anymore. In the last three decades, Todd has received numerous accolades for his work, including the Bioneers Lifetime Achievement Award in 1998 and the Global Visionary Award from the City of Chicago in 2006. In 1999, Time magazine named him a “Hero of the Earth.” The Lemelson-MIT Program for Invention and Innovation calls him one of the top 35 inventors of the 20th century. But Todd’s recent honor may be the most fitting. In June, he won the first annual Buckminster Fuller Challenge, an international competition among hundreds of scientists and inventors from 27 countries. Named after the iconoclastic architect, inventor and futurist who died in 1983, the Buckminster Fuller Institute gave Todd its grand prize of $100,000 for a submission that, according to the judges, best exemplified the guiding principles of Fuller’s life: a comprehensive, carbon-neutral plan for restoring the huge swaths of Appalachia that have been decimated by years of strip mining. It’d be hard to find someone more deserving of the award. “Bucky” Fuller, as his friends — Todd among them — called him, was a maverick scientist and thinker whose inventions include the geodesic dome. Think of the golf ball-shaped EPCOT Center in Orlando, Fla., or the Biosphere in Montréal — and the three-wheeled Dymaxion car, which was built in the 1930s and got 30 miles to the gallon. Fuller, who once proposed building a clear dome over New York City, combined a fertile imagination with a youthful idealism, which may explain why, in his seventies, he achieved a cult following among the Woodstock generation. On a recent afternoon, in his office at the University of Vermont, Todd looks as though he’s just returned from a day of clamming. His white, thinning hair is disheveled, and he’s dressed in a rumpled linen shirt, baggy shorts and sneakers. Ruddy-faced and hale, Todd has the rough, muscular hands and thick fingers of someone who’s spent years foraging in tidal pools and wetlands for snails and eelgrass. Sitting on a tabletop near a window is a mammoth Mason jar. At first glance, the sealed container, brimming with greenish water, reeds and silt, appears lifeless. But on closer inspection, as Todd points out, various life forms are teeming inside. The jar, part of a grad student’s experiment, contains mining waste from the Omya plant in Pittsford, which processes marble into calcium carbonate. About two years ago, the water, drawn from Lake Champlain, was “seeded” with the waste, as well as hundreds of different life forms from ponds and streams throughout the region. The species weren’t handpicked for the experiment, Todd explains. Instead, they’re being left to their own devices. Inside this potentially toxic environment, some species will die off while others will predominate. Ultimately, Todd is optimistic that the surviving life forms will be useful for repairing damaged soils and cleaning up polluted ecosystems, not just in Vermont but elsewhere. Todd has been looking for eco-friendly solutions to humanity’s messes since college at Montréal’s McGill University, where he studied agriculture and tropical medicine. He later moved on to studying fisheries and oceanography at the University of Michigan. After a short stint as a professor at San Diego State, Todd was invited to join the Woods Hole Oceanographic Institution in Woods Hole, Mass., as an assistant scientist. It was there that the major influence on his life — his wife, Nancy Jack Todd, whom he met in high school — encouraged him to put a “human face” on his biological research. (Nancy has shared in many of John’s prestigious awards, and is herself an accomplished writer as well as a dancer.) When the couple grew dismayed by a science that seemed only interested in chronicling the destruction of life on Earth, they launched the New Alchemy Institute in 1969, a name that paid tribute to the idealistic experimenters of the Middle Ages. The couple set up shop on a 12-acre farm in Cape Cod, where their new alchemy — later dubbed ecological design — could be explored. The goal, Todd recalls, was to live according to a principle Wendell Berry once called “solving for pattern” — that is, seeking solutions that don’t create new, unintended problems of their own. It makes no sense, Todd says, if the methods we use to grow food, purify water and generate energy are as environmentally harmful as the problems they were designed to solve. In 1974, the Todds returned to Canada to begin work on The Ark for Prince Edward Island. This biosphere-like community applied many of the same tools and principles that have been used on Cape Cod. Opened in 1976 and dedicated by then-Canadian Prime Minister Pierre Trudeau, The Ark was a sun- and wind-powered community that featured living quarters, a lab and research center, greenhouses, food gardens and a fish farm. The Ark required no fossil fuels and — though the concept had yet to be conceived of, let alone named — was largely carbon neutral. In 1981, the Todds left New Alchemy and founded Ocean Arks International, an organization that’s still around today. Its primary mission has been to develop eco-friendly solutions to degraded environments, especially polluted waterways. (The name, “Ocean Arks,” comes from a wind-powered ocean vessel Todd hoped to build and sail around the world one day as an envoy for ecologically sustainable living.) Since 1982, Nancy Jack Todd’s Annals of Earth have chronicled OAI’s work, which now totals more than 80 ecological waste-treatment projects worldwide. Those projects include a biological waste-treatment facility built in South Burlington that incorporated many of the underlying principles at work in natural wetlands. Built in 1995 as a demonstration project funded by the U.S. Environmental Protection Agency, it used a series of giant steel tanks containing microorganisms, algae, plants, fish and animals to digest and absorb nutrients, biological toxins and heavy metals. This “Eco Machine” converted 80,000 gallons per day of raw sewage into relatively pure water in just two days. Though the demonstration project was a success, the South Burlington Eco Machine was eventually mothballed. By 2000, EPA funding had dried up and the city had already built a conventional, chemical-based treatment plant. For a couple of years afterward, Todd tried to see how many different beneficial byproducts could be grown on the site using organic waste from the Magic Hat Brewery. In the end, they identified more than a dozen, which ultimately launched four new Vermont food companies that are still around today. Todd applied similar ideas to the design of the proposed Intervale Food Enterprise Center, a state-of-the-art greenhouse and food-processing plant. The “Eco-Park,” as it is known, would reuse and recycle nearly all its waste in a virtual closed loop. 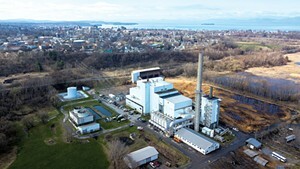 Steam from the wood-fired McNeil Generating Station would be piped underground to heat a 21,000-square-foot greenhouse and food-processing center. Spent grain and hops from a local brewery would be used for growing oyster mushrooms. Waste from the mushroom operation would be used for raising red worms, which in turn would produce compost for growing local flowers and vegetables. Later, the worms would be fed to fish and shrimp raised for market. Unfortunately, the project has been stuck in limbo for more than five years. Todd has since moved on to other commercial endeavors, including Todd Ecological Design, Inc., which is run by his son and builds ecological technologies for food production, waste purification and environmental restoration. There’s an ephemeral nature to some of Todd’s projects that, in a sense, echoes those of Buckminster Fuller; many of his ideas worked but never caught on. For example, a one-fifth-scale model of the Ocean Ark was built and sailed in Buzzards Bay off the Massachusetts coast. However, Todd wasn’t able to design the technology or raise the money (estimated at about $50 million) to build a full-sized version. But perhaps the best — or worst — example of the impermanence of Todd’s work was the Ark on Prince Edward Island. In 2001, the U.S. Department of Energy named The Ark one of the most significant buildings of the 20th century. That same year, the owners, recognizing the land’s development potential, bulldozed it. In the 1970s, Todd partnered with David Sellers, an innovative and forward-thinking architect living in Warren who designed, among other things, Patch Adams’ Gesundheit Hospital. For a time, Todd and Sellers worked together, with Fuller, on a project to complete the Cathedral of St. John the Divine in New York City, the world’s largest Gothic cathedral. Todd proposed building a south-facing arm of the nave that would feature different chapels dedicated to each of the five kingdoms of life on Earth. Alas, funding for that project never materialized either, and the collective ideas of Todd, Sellers and Fuller were never realized. To date, the New York cathedral remains unfinished. Sellers also recalls partnering with Todd on a project to build a “solar sewer,” similar to an experimental one they’d built in the Mad River Valley. “Madeleine Kunin, who was governor at the time, walked on the planks above this giant swimming pool filled with sewage and plants growing out of it,” Seller recalls. “She said it was the coolest thing she’d ever seen.” But according to Sellers, Todd later got “screwed” out of his idea by some rich, eccentric “Dr. No” character who forced Todd to buy back his own technology. Like any good scientist, Todd hasn’t dwelled on his mistakes but learned from them. In fact, if there’s a common theme running through his work, it’s an unwavering sense of hope for the future, even in the face of daunting challenges. And there aren’t many challenges more daunting than the threat of global warming. There are more than 1.5 million acres of strip-mined coal lands in Appalachia. Decades of mining have leveled forests, removed topsoil, lopped the tops off of mountains and filled the valleys with trillions of gallons of toxic, metals-laden coal slurry that sit behind enormous impoundment dams, threatening entire towns. Driving this destruction is the world’s insatiable hunger for coal. About half the electricity consumed in the United States comes from coal-fired plants. Since 2002, coal prices have quintupled, rising from $22 dollars per ton to more than $130. During that same period, global coal consumption has risen 35 percent. The ever-growing demand has put even greater pressure on the Appalachian coalfields. The end result is increasing carbon-dioxide levels in the atmosphere that trigger climate change. About two years ago, Todd was approached by the Lewis Foundation of Cleveland to come up with a plan for decontaminating coal wastes. Todd and his assistants began by assembling an extensive library of all the scientific data they could find on the ecological damage to Appalachia. So Todd asked the Lewis Foundation if he could “change course” and come up with a more comprehensive solution to the problem. That award-winning vision, “Comprehensive Design for a Carbon Neutral World: The Challenge of Appalachia,” is literally a ground-up approach that begins with restoring degraded soils and then building on them through a succession of ecological activities similar to how nature would heal itself, given enough time — centuries, at least — and left to its own devices. For example, former mine workers would be employed for their considerable knowledge about how to, literally, move mountains. The scale of the cleanup would trigger the development of a large remediation industry, perhaps gleaning useful byproducts from the detoxifying processes. But Todd also knew that his vision had to be more than just ecologically sound; it had to economically viable, too. No matter how innovative or cutting-edge the remediation science, Todd believed it would be impossible, even unethical, to propose a project of this scale without including the concept of “an ownership society” in which all citizens of the region share in the emerging wealth. When asked if he’s optimistic about the future, Todd pauses for a moment, closes his eyes and squeezes his forehead between his fingers. On the one hand, he notes, China is building two coal-fired plants per week while consuming the world’s resources at a rate beyond comprehension; he says he is “completely convinced” that China is going to run out of water within the next few years. At the same time, Todd also believes that people are finally waking up to the enormity of the challenge of climate change. He recalls that, after giving his acceptance speech at the Buckminster Fuller award ceremony, he was approached by the president of a major coal company, who asked Todd if he would be willing to advise him on changing course.